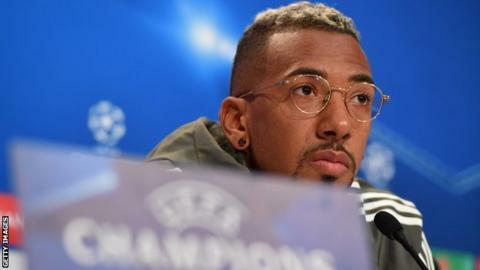 Jerome Boateng had considered quitting Bayern Munich but says returning coach Jupp Heynckes has brought fun back to training before hosting Celtic. Heynckes, 72, came out of retirement after Carlo Ancelotti's sacking. "I decided to stay here and I didn't want to just run away after a bad spell," said Germany defender Boateng. "You can see from the way we are training now that the team is having fun again and that the trainer has an intuition for things." Celtic are away at Bayern in the Champions League at 19:45 BST on Wednesday. Boateng missed the first two months the year with a shoulder injury and then hurt his thigh in May, ruling him out until September. The 29-year-old World Cup winner struggled to win a starting place on his return and Ancelotti left him out of the squad for Bayern's 3-0 defeat away by Paris St-Germain three weeks ago. Several senior players had already complained to chairman Karl-Heinz Rummenigge that training sessions under Ancelotti were too easy and the Italian was sacked a day after that Champions League loss. But Saturday's 5-0 Bundesliga drubbing of Freiburg was the perfect start for Heynckes, now in his fourth spell in charge of the German champions, and the restored Boateng. "Celtic are a good opponent who can break very quickly and have very fast players," said Boateng of the Group B game at the Allianz Stadium. "But we want to be on the front foot and score quickly if we can. "We want to bounce back after the PSG loss with a win. It is an important game." Poland striker Robert Lewandowski echoed the suggestion that Heynckes has already made an impact after a week back. "He wants us to focus on the details," he said. "In training sessions, every pass and every shot is important. "We need to go forward together as a team and have fun." Lewandowski, who has found the net 10 times in his past 12 Champions League matches and scored against Freiburg, has made no secret of his desire to win the Europe's elite trophy this season. "It's a very important game for us," he said. "Three points after two games is not enough for us. "Now we have to go from one win to the next." Heynckes, who has twice won the competition as a manager, says Celtic's recent Champions League results are a warning to his side. "You cannot make the mistake of underestimating Celtic," he said. "They've won the league in Scotland six years in a row and last season drew with Borussia Monchengladbach and Manchester City in the group stages. "They have a very good coach. They're powerful and aggressive. They're a very competitive team." Bayern began their group campaign with a 3-0 home win over Anderlecht - a scoreline matched impressively by Celtic in Belgium three weeks ago. It meant Brendan Rodgers' side had recovered well from their own bruising 5-0 defeat at home by PSG and avoiding a loss in Munich would raise the Glasgow side's hopes further that they could qualify for the last 16 by finishing ahead of Bayern. "You can always lose a game in the Champions League, but FC Bayern have great ambitions," added Heynckes. "The players are fired up. "I see how hard the players are working and it's only a matter of time before we play really good football."